25th Battery: No return. Recall, while in transit to New Orleans in January, this battery’s transport wrecked. This “hard luck” battery remained at New Orleans, assigned to the Fourth Division, Nineteenth Corps through October as part of the city defenses. Captain John A. Grow remained in command. In the previous quarter, the battery reported four 3-inch Ordnance Rifles. 26th Battery: Reprting at Thibodaux, Louisiana, with four 12-pdr Napoleons. Also suffering loss in the January shipwreck, the 26th was, at the reporting time, part of the District of LaFourche. Captain George W. Fox remained in command of the battery, organizationally assigned to the Fourth Division, Nineteenth Corps. 27th Battery: At Camp Niagara (? ), Pennsylvania with four 12-pdr Napoleons. In July the battery moved from Camp Barry, D.C. to the Department of the Susquehanna, and assigned to the garrison at Philadelphia. Captain John B. Eaton commanded this battery. 28th Battery: At Fort Schuyler, New York with “infantry stores.” The battery served at Fort Schuyler and Sandy Hook. Captain Josiah C. Hannum retained command. 29th Battery: No return. At the end of June, the battery was run down with troops with remaining enlistments assigned to the 32nd Battery. However, at least through the first week of July the battery remained on the organizational returns, assigned to the Harpers Ferry garrison. Captain Otto Diedrich remained commander, on paper at least. 30th Battery: On Maryland Heights, Maryland, with six 12-pdr Napoleons. Captain Adolph Voegelee was dismissed in August, having not been in the field for some time. Lieutenant Alfred Von Kleiser, who’d lead the battery through much of the last year, was promoted to battery captain in his place. At this time of the war, the battery was part of the Department of West Virginia. 31st Battery: No return. Captain Gustav Von Blucher was in command. The battery appears in the Department of West Virginia. But as it was reduced, with many of the men attached to the 30th Battery, the battery was in effect only a paper designation. Von Blucher himself was serving as a staff officer with the Artillery Reserve, Army of the Potomac. 32nd Battery: At Maryland Heights, Maryland with six 3-inch Ordnance Rifles. Captain Charles Kusserow remained in command. And the battery remained with Maryland Heights Division, staying there as the command was folded into the Department of West Virginia. 33rd Battery: No return. Authorized on July 9, 1863, mustered on September 4. It was initially assigned to the Artillery Camp of Instruction, Camp Barry, in the Department of Washington (Twenty-second Corps). Captain Algar M. Wheeler commanded. However, with Wheeler still in New York, Lieutenant J. DeWitt Woods held operational command of the battery at its first posting. 34th Battery: Not listed. This number was reserved for Battery L, 2nd New York Artillery. Captain Jacob Roemer’s battery, then serving in East Tennessee, would officially take it’s “Independent” number in November. 35th Battery: Not listed. Authorized on July 9. Captain James B. Caryle was given the commission to recruit the battery. But it never completed organization. The authority was recalled. The recruited men were assigned to Battery A, 16th New York Heavy Artillery. 36th Battery: Not listed. On August 11, 1863, Captain Charles Graham Bacon was authorized to recruit this battery. On October 14, authority was revoked and the men recruited by that time were transferred to the 13th New York Heavy Artillery. See? An even dozen in existence, even if only on paper. Those in actual service being mainly in “garrisons” – New York, Philadelphia, Washington, Harpers Ferry, and New Orleans. But still having equipment to account for. 26th Battery: 148 shot, 12 shell, 48 case, and 12 canister for 12-pdr Napoleons. 27th Battery: 192 shot, 64 shell, 192 case, and 64 canister for 12-pdr Napoleons. 30th Battery: 308 shot, 128 shell, 320 case, and 112 canister for 12-pdr Napoleons. 32nd Battery: 120 canister and 104 bullet shell for 3-inch rifles. 32nd Battery: 583 shell and 393 case for 3-inch rifles. 26th Battery: Twenty-five (?) army revolvers, twelve cavalry sabers, and twelve horse artillery sabers. 27th Battery: Seventeen army revolvers, thirty cavalry sabers, and ten horse artillery sabers. 30th Battery: Six army revolvers and fifteen cavalry sabers. 32nd Battery: Nine army revolvers, thirty-six cavalry sabers, and eleven foot artillery swords. This wraps up the entire page from the third quarter 1863 summaries allocated to New York units. In addition to these light batteries, New York provided several heavy artillery organizations. As those fall outside these summaries, I’ll look at those at the end of the quarter’s entries as part of a broader look at all the “heavies” then in service. Last post, I mentioned the Pennsylvania militia and emergency batteries appearing on the Federal order of battle during the crucial summer months of 1863. While those batteries escaped mention in the summaries, in the interest in cataloging ALL the artillery batteries from Pennsylvania, I do wish to at least name the organizations for reference. I earnestly invite the attention of the people of Pennsylvania to the general orders issued by these officers on assuming the command of their respective departments. The importance of immediately raising a sufficient force for the defense of the State cannot be overrated. The corps now proposed to be established will give permanent security to our borders. I know too well the gallantry and patriotism of the freemen of this Commonwealth to think it necessary to do more than commend this measure to the people, and earnestly urge them to respond to the call of the General Government, and promptly fill the ranks of these corps, the duties of which will be mainly the defense of our own homes, firesides, and property from devastation. And the people of Pennsylvania did respond. Over thirty-five regiments (though not “full” in terms of the number of companies) and numerous independent infantry companies formed up, in addition to cavalry battalions and companies. The artillery component was eleven batteries, most of which existed as militia before the declaration of the emergency. Frishmuth’s Battery: The Philadelphia Union Battery commanded by Benoni Frishmuth. Mustered on June 26 and discharged on August 1. Four officers and 100 men. The battery had four guns, “the private property of [Frishmuth’s] company.” A return from July 10 places the battery at Harrisburg, part of a brigade led by Brigadier-General William Hall, New York National Guard. Then on July 31, the battery was back in Philadelphia. Miller’s Battery: Philadelphia Howitzer Battery. Commanded by Captain E. Spencer Miller. Mustered June 19 and discharged July 25. Three offices and 99 men. This battery served in Brigadier-General William F. Smith’s division of the Susquehanna Department. They supported the movement to Carlisle and subsequent pursuit of the Confederates. Smith’s report indicates the battery had four pieces. Landis’ Battery: 1st Philadelphia Battery. Captain Henry D. Landis’ battery mustered on June 27, serving until discharged on July 30. Three officers and 105 men. Also from Philadelphia and also assigned to Smith’s division. This battery saw action at Sporting Hill and Carlisle. Returns at the end of July place the battery at Chambersburg. Joseph Knap’s Battery: Captain Joseph M. Knap had recently mustered out from Battery E, Pennsylvania Light Artillery (which is the connection to the “original” Knap’s Battery). But he responded to the governor’s call, leading a battery of five officers and 121 men, which mustered on June 27. They mustered out on August 16. Ermentrout’s Battery: Captain William C. Ermentrout’s was a company of heavy artillery. Mustered on July 3, and discharged on August 25, the company numbered five officers and 144 enlisted. The battery formed in Reading and saw service around Camp Curtain and Harrisburg. Guss’s Battery: Chester County Artillery. Commanded by Captain George R. Guss. The battery consisted of five officers and 144 enlisted. It mustered on July 3 and was discharged on August 25. At the end of July, this battery was at Reading, Pennsylvania. Fitzki’s Battery: Second Keystone Battery with Captain Edward Fitzki in command. Five officers and 138 enlisted mustered with this battery, starting on July 6. The battery mustered out on August 24. Fitzki had served with Battery G, 1st Pennsylvania earlier in the war. Returns place the battery at Camp Curtain and Harrisburg during July. Woodward’s Battery: Captain William H. Woodward’s battery mustered on July 8. Unlike these other batteries, Woodward’s was not mustered out until November 4, 1863, just short of a full six month enlistment. The battery mustered with three officers and 128 enlisted. Returns through July have the battery unattached and serving at Philadelphia. Tyler’s Battery: Park Battery. Captain Horatio K. Tyler, who’d served earlier in the war with an infantry regiment, commanded this battery. Mustered on July 16, the battery consisted of four officers and 138 enlisted. In late August, the battery was in Colonel James Mulligan’s Brigade serving in West Virginia. The battery remained in service until January 28, 1864. Robert Nevin’s Battery: (Not to be confused with John Nevin’s Battery H, Pennsylvania Light.) Captain Robert J. Nevin’s battery mustered sometime in the first week of July and numbered five officers and 147 men. On July 10, the battery was on the returns for Camp Curtain. Then in late August, the battery reported a posting at Philadelphia. It was armed with four 12-pdr Napoleons and two 3-inch Ordnance Rifles. During the fall, the battery was posted to West Virginia. On January 7, 1864, the battery was mustered out in Philadelphia, but most of the men, including Nevin, would re-enlist for three years. 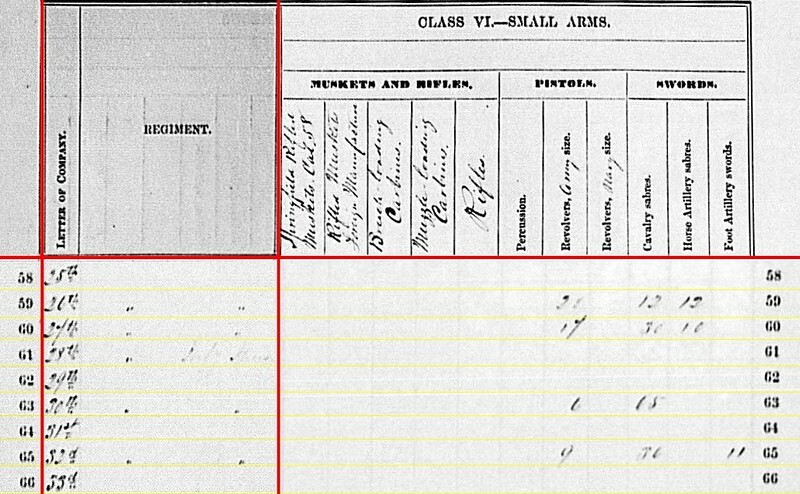 As such unit was re-designated Battery I, Pennsylvania Light Artillery. Also, we might list Captain Matthew Hasting’s Keystone Battery which was on duty at Camp Barry until the end of June. That battery appears on Bates’ list as a militia battery, though was actually on service in Washington, D.C. As mentioned in the earlier post, the battery mustered out on August 20. From the perspective of a “bean counting” clerk at the Ordnance Department, only four of these batteries were mustered prior to the end of the second quarter reporting period (June 30). And only three of these batteries would be in Federal service at the end of third quarter (September 30). So this gives the clerks a clean alibi for not allocating lines on the summary. Their tracking was still not thorough, however, as they would allocate only one line to the three batteries for the third quarter (which we must wait to discuss). Regardless of the administrative particulars which prevented the inclusion of the emergency batteries on the summaries, I offer them here as to help paint a more complete picture. While briefly serving, it was service at a time of a crisis. And the batteries appear on orders of battle for formations thrown into that crisis. Their story also allows us to consider the structure of state and local militia organizations in relation to the more familiar volunteer organizations in Federal service.